Schwannomas are tumors derived from the myelin sheath of nerves. As schwannomas grow they can displace and compress nerves causing pain, weakness and numbness. Schwannomas usually exist as a solitary mass and can occur at random. Having no racial or sexual predilection, schwannomas usually occur in individuals between the ages of 20-50 years old. The most common sites for schwannomas are the head, flexor surfaces, upper extremity, lower extremity and trunk. It is very rare for schwannomas to become malignant, but surgery is still the principal treatment to eliminate symptoms that may persist and to correctly diagnosis the tumor. 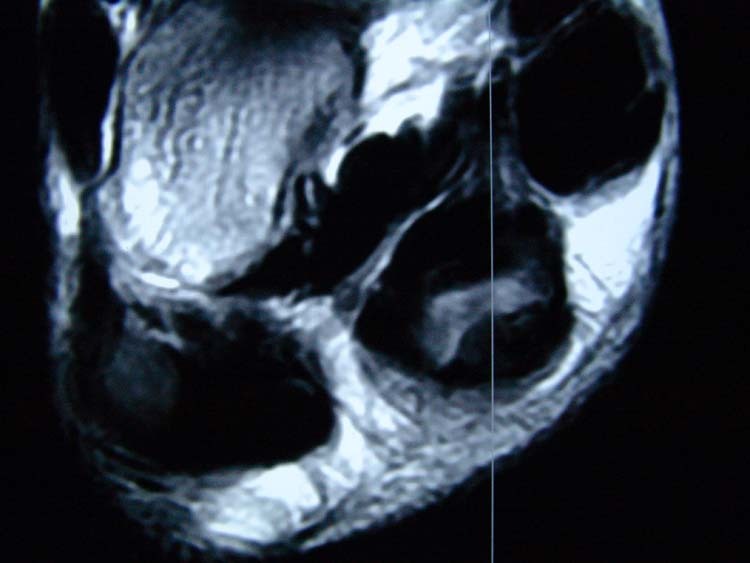 We discuss one case of a schwannoma found in the foot. Key Words: Schwannoma, neurilemmona, peripheral nervous system tumors, Magnetic resonance imaging. Schwannomas can be found in various parts of the body with the most common site being the head. However, in the lower extremity they are most commonly found in the deep tissues of the foot. Unlike neurofibromas, Schwannomas rarely metastasize. As a schwannomas grows along the nerve sheath the fibers begin to push outward. Studies relate a correlation between size of the nerve trunk and size of the lesion. Lesions can be small or large, usually with a diameter less than 8cm when located in the foot. [11,12] Clinical evaluation of symptoms is sometimes a great indicator of what the lesion may be, but Magnetic Resonance Imaging (MRI) of the lesion is standard for obtaining differential diagnosis and determining the size and depth of the lesion. Once a lesion of this type is identified on MRI it must be surgically removed. The specimen is then sent to pathology, which allows the definitive diagnosis of Schwannoma. A 56 year-old female with a past medical history of hypertension, depression, and hypothyroidism first presented at age 54 with complaints of left foot pain and swelling of about one year duration. She related that she was bitten by a bug in the Caribbean and had swelling and discomfort since then. She denied any injury or trauma. She also denied constitutional signs of infection. Initial radiographs failed to reveal any bony abnormalities or tumor like masses. The patient was then treated conservatively with an NSAID and change of shoe gear. A year later she returned complaining of an increase in the size of the left foot. She explained that her symptoms had never completely resolved and she noticed that her left foot was getting larger and more painful in her shoes which also were not fitting properly. 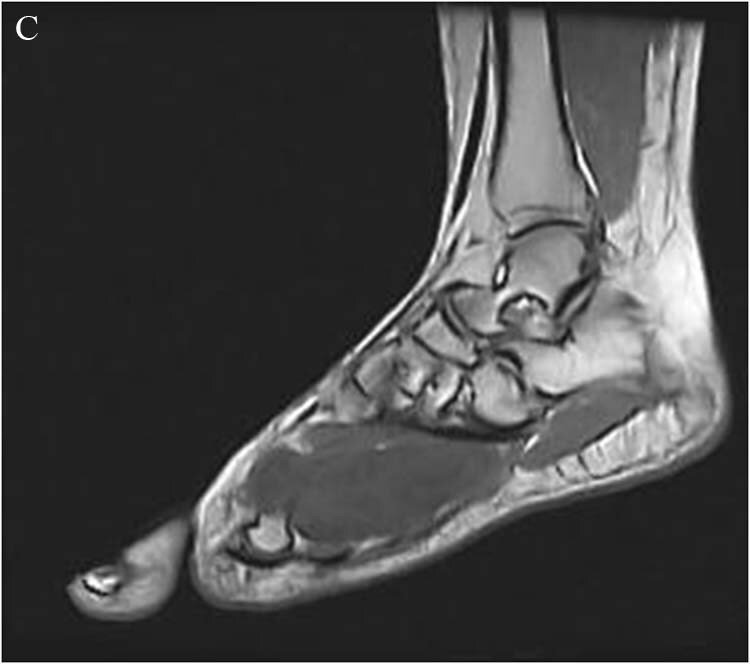 An MRI was obtained which identified a large cystic lesion beneath the metatarsals extending from the cuboid to the metatarsophalangeal joints. (Figs.1 A – F) The lesion measured 8.0cm length, 2.8cm in depth and 3.1cm in width. The lesion coursed distally between the first and second metatarsals. Following the MRI the patient was scheduled for surgical removal of the mass in her left foot. (Figs.2 and 3) Initial histological report suggested neurofibromatosis but further analysis determined the lesion was a schwannoma with no evidence of sarcomatous transformation. The patient’s swelling was resolved within several weeks but she continued to complain of numbness between the first and second metatarsals. This was an ongoing complaint up to 5 months post-operatively. At that time she was told that she may have some permanent numbness, which is not uncommon for a lesion of this size and in this area. 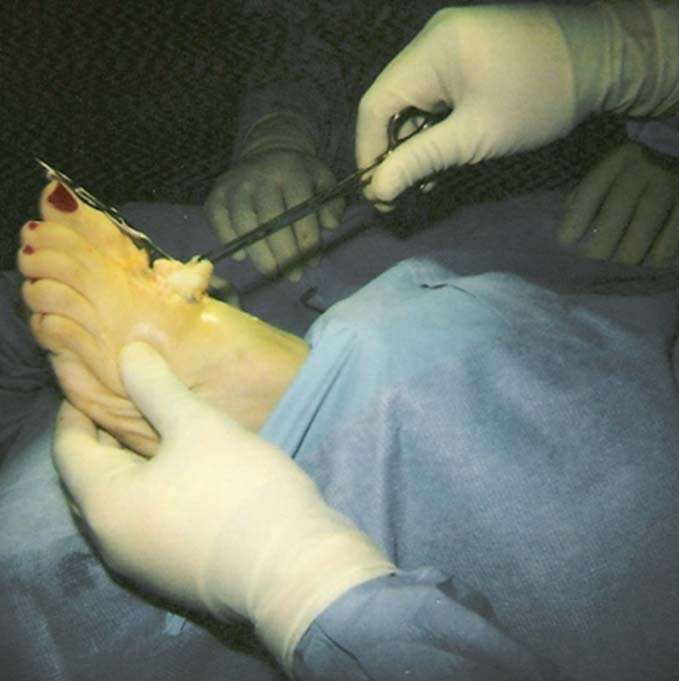 Figure 3 Intraoperative measurement of schwannomaremoved from the plantar left foot. The Schwannoma measures 8cm (with adjacent stump total length 12cm). He spoke of how his patient had an unsuccessful tarsal tunnel release then later removal of the schwannoma from the sciatic nerve alleviated all symptoms in the foot. A similar study by Gominak presents a case in which the posterior tibial nerve was thought to be compressed by the flexor retinaculum. Release of the retinaculum was performed ineffectively. It was later determined that the patient had a thigh schwannoma which, when resected, alleviated all lower extremity symptoms. Therefore when a patient presents with pain in the foot and ankle a more proximal tumor should be investigated if symptoms persist after failed treatment. Nerve sheath tumors are usually initially recognized by MRI. They have an intermediate to moderately bright signal on T1-weighted images, and a bright, heterogeneous signal on T2-weighted images. 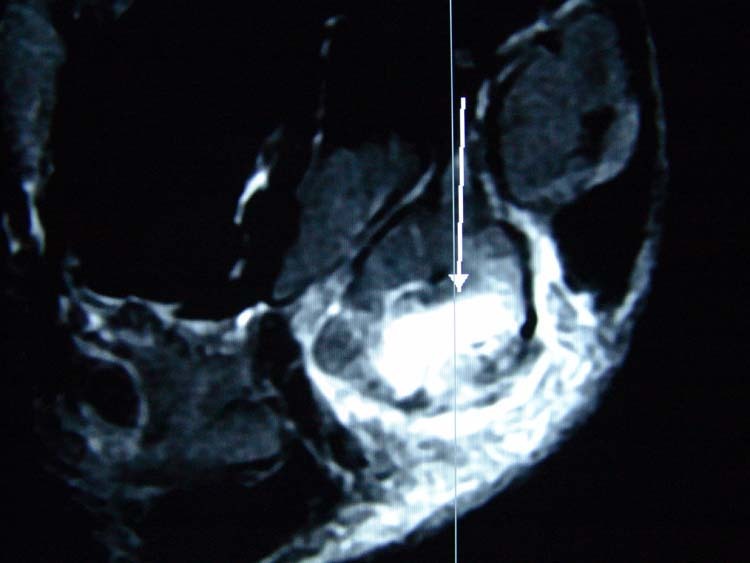 MRI is useful in identifying the exact location and size of the tumor. However, it is impossible to actually diagnose a schwannoma utilizing MRI alone. The tumor must be surgically excised and sent for pathological evaluation. The pathology report will give the definitive diagnosis of schwannoma and establish whether the lesion is benign or malignant. After surgery symptoms should subside but the patient may continue to have paraesthesia, as the above patient. Motor and sensory abnormalities usually return to normal if the schwannoma is found and resected promptly following initial finding. When they are resected the function of the nerve should not be compromised. With most surgical procedures patients are warned of risk of nerve damage, we must especially warn them of an increase in this risk with surgical excision of a schwannoma. The patient in this case study endured several months of post operative numbness. She has been followed since then and relates no symptoms at this time. In conclusion, schwannomas are rare solitary nerve sheath tumors. They should always be considered as a differential diagnosis when tarsal tunnel syndrome, neuromas, nerve entrapment or radiculopathy18 is suspected. Schwannomas found in the proximal aspect of the lower extremity can also cause distal symptoms or injury, so this must also be considered, especially if the previous differentials have been ruled out. Early diagnosis can prevent permanent nerve damage, soft tissue or boney deformity. 1. Stout AP: The peripheral manifestations of the specific nerve sheath tumor (Neurilemoma) Am J Cancer 24: 751 – 796, 1935. 2. Berlin SJ: Soft Somatic Tumors of the Foot: Diagnosis and Surgical Management. Futura Publishing Co, Mount Kisco, NY: 227, 1976. 3. Stout AP: Tumors of the peripheral nervous system. In Atlas of tumor pathology. Section 2, Fasicle 6. Washington, D.C., Armed Forces Institute of Pathology, 1949. 4. Giannestras NJ, Bronson JL: Malignant schwannoma of the medial plantar branch of the posterior tibial nerve (unassociated with von Recklinghausen’s disease) A Case Report. J Bone Joint Surg 57A (5): 701 – 703, 1975. 5. Verocay J: Zur Kenntnis der Neurofibroma Beitr Pathol Anat 48:1 – 69, 1910. 6. Das Gupta TK, Brasfield RD, Strong EW, Hajdu SI: Benign solitary schwannomas (neurilemomas). Cancer 24: 355 – 366, 1969. 7. Ogose A, Hotta T, Morita T, Yamamura S, Hosaka N, Kobayashi H, Hirata Y: Tumors of peripheral nerves: correlation of symptoms, clinical signs, imaging features, and histologic diagnosis. Skeletal Radiol 28(4):183-8, 1999. 8. Spiegl PV, Cullivan WT, Reiman HM, Johnson KA: Neurilemoma of the lower extremity. Foot Ankle 6 (4): 194 – 198, 1986. 9. Wolpa, ME, Johnson JD: Schwannoma of the fifth digit. 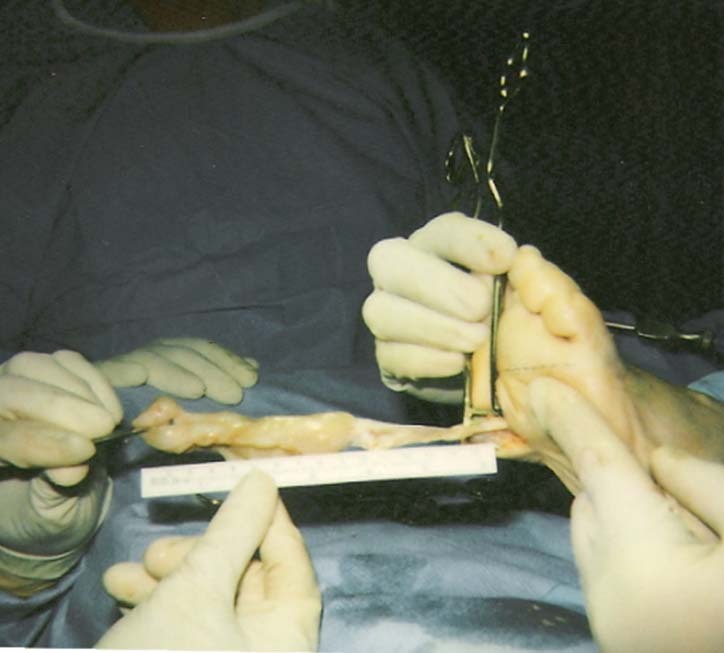 J Foot Surg 28 (5): 421 – 424, 1989. 10. Takada E, Ozaki T, Kunisada T, Harada Y, Inoue H: Giant schwannoma of the back. Arch Orthop Trauma Surg 120: 467 –469, 2000. 11. Maleux G, Brys P, Samson I, Sciot R, Baert AL: Giant schwannoma of the lower leg, (Eur) Radiol. 7: 1031 – 1034, 1997. 12. Joyce M, Laing AJ, Mullet H, Mofidi A, Tansey D, Connolly CE, McCabe, JP: Multiple schwannomas of the posterior tibial. Nerve Foot Ankle Surgery 8:101 – 103, 2002. 13. Liebau C, Baltzer AW, Schneppenheim M, Braunstein S,•Koch H, Merk H: Isolated peripheral neurilemoma attached to the tendon of the flexor digitorum longus muscle. Arch Orthop Trauma Surg 123: 98 – 101, 2003. 14. White NB: Neurilemomas of the extremities J Bone Joint Surg 49A: 1605 – 1610, 1967. 15. Masson WP: Experimental and spontaneous schwannomas (peripheral gliomas.) Am J Pathol 8: 367, 1943. 16. 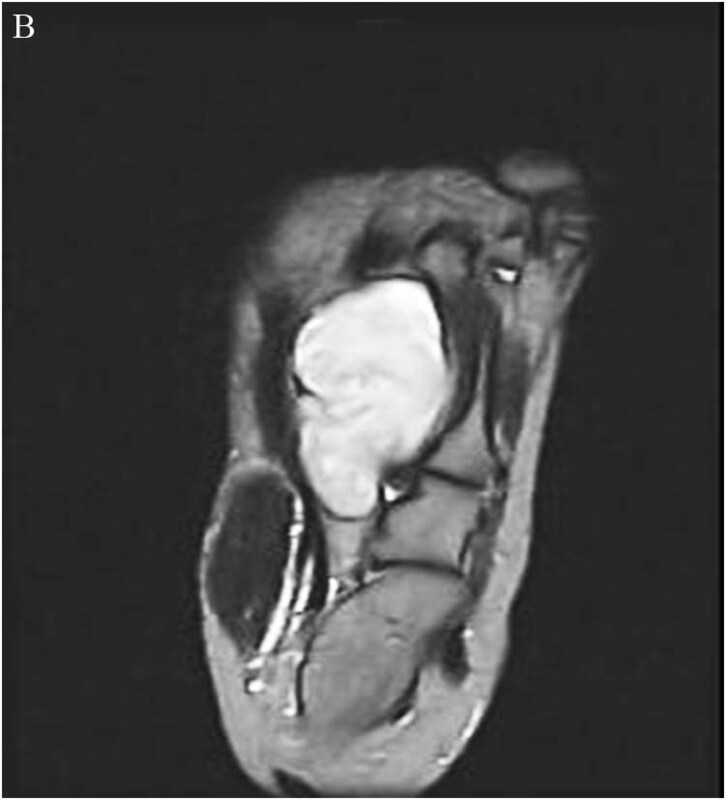 Gominak S , Ochoa J: Sciatic schwannoma of the thigh causing foot pain mimicking plantar neuropathy. Muscle and Nerve 21 (4): 528 – 530, 1998. 17. 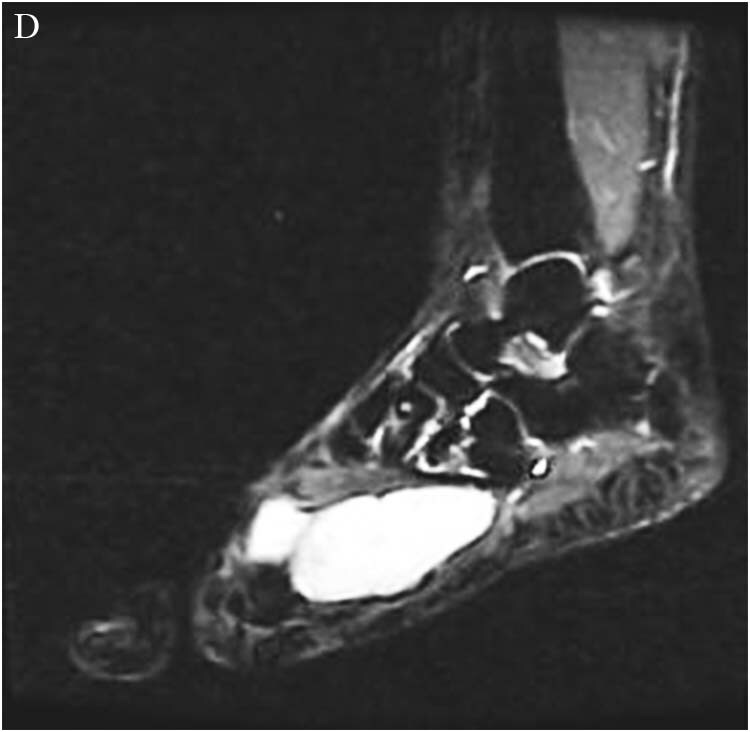 Carpintero P, Gascón E, Abad JA, Ruza M: Foot schwannomas that mimic nerve – Entrapment syndromes a report of three cases. J Am Podiatr Med Assoc 96(4): 344 – 347, 2006. 18. 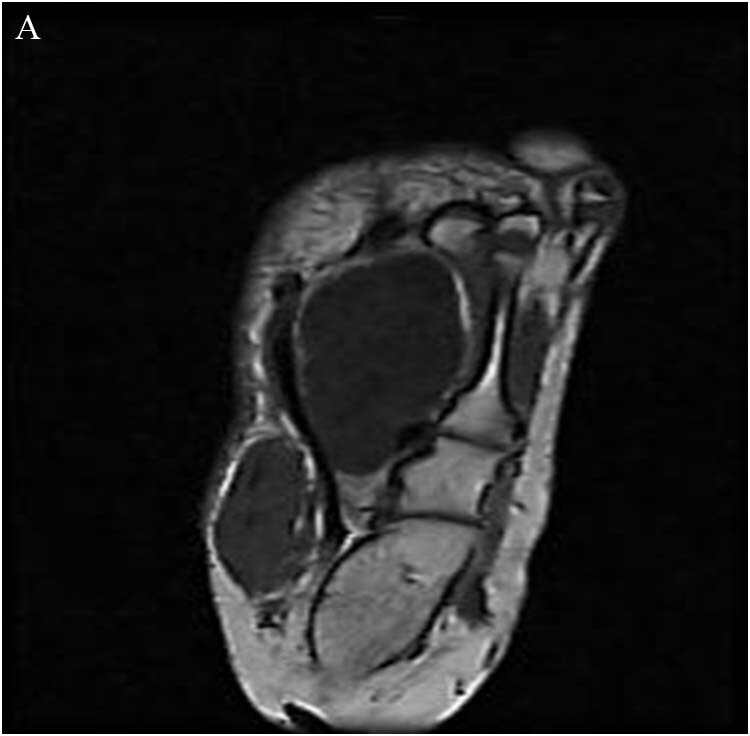 Persing J, Nachbar J, Vollmer D: Tarsal Tunnel Syndrome Caused by Sciatic Nerve Schwannoma. Ann Plast Surg 20 (3) 252 – 255, 1988. 1 Dept. of Podiatric Surgery, Chardon Medical Center, University Hospital at Geauga, OH. 2 Submitted while 3rd year resident Dept. of Surgery, Louis Stokes Cleveland VA Medical Center, Cleveland, OH. 3 Submitted while 3rd year resident Dept. of Surgery, Louis Stokes Cleveland VA Medical Center, Cleveland, OH. 4 Department of Surgery, Podiatry Division, Louis Stokes Cleveland VA Medical Center, Cleveland, OH. We present a case of closed, pure tibiotalar dislocation. A 21 year-old volleyball player sustained a pure ankle dislocation after jumping up at the net and landing on the floor with a fully plantarflexed foot that was inverted during landing. After closed reduction, a short leg cast was applied for ankle immobilization. 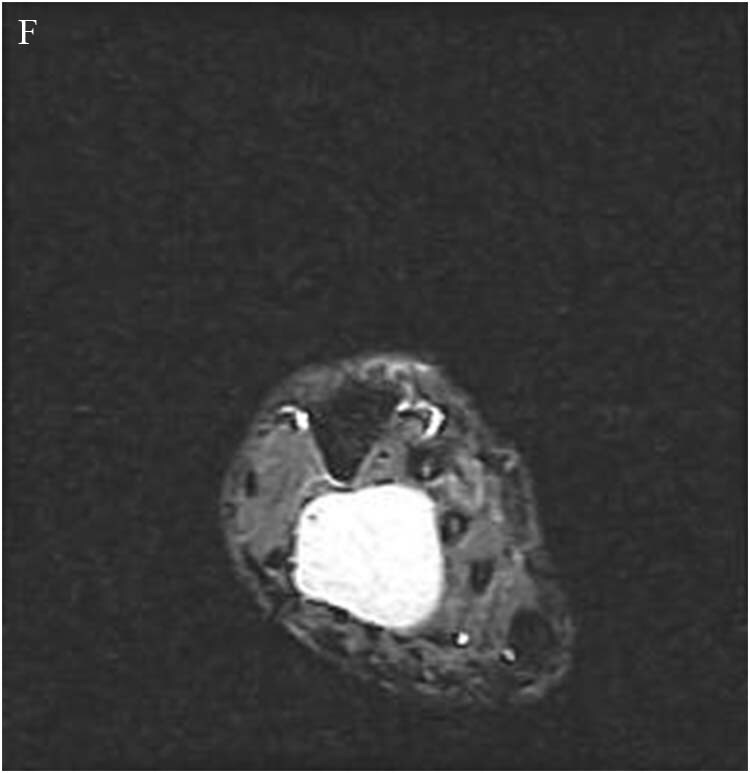 Magnetic resonance imaging demonstrated rupture of the anterolateral capsuloligamentous structures and talus bone contusion. The cast was removed at two months post-injury and full weight-bearing was permitted at three months. The patient returned to pre-injury level of activity at 6 months. Three years post-injury, the patient is asymptomatic, without signs of instability or degenerative arthritis. Key words: Tibiotalar dislocation, talus contusion, magnetic resonance imaging. This is the first case of pure ankle dislocation in the literature, with documented talus bone contusion. This finding is crucial for proper treatment planning in order to avoid complications like tibiotalar degenerative arthritis and talar avascular necrosis. Figure 1 The anteroposterior view demonstrates tibiotalar joint dislocation without concomitant malleolar fracture or syndesmotic injury. Physical examination in the emergency room showed a deformed ankle without neurovascular deficit of the foot. 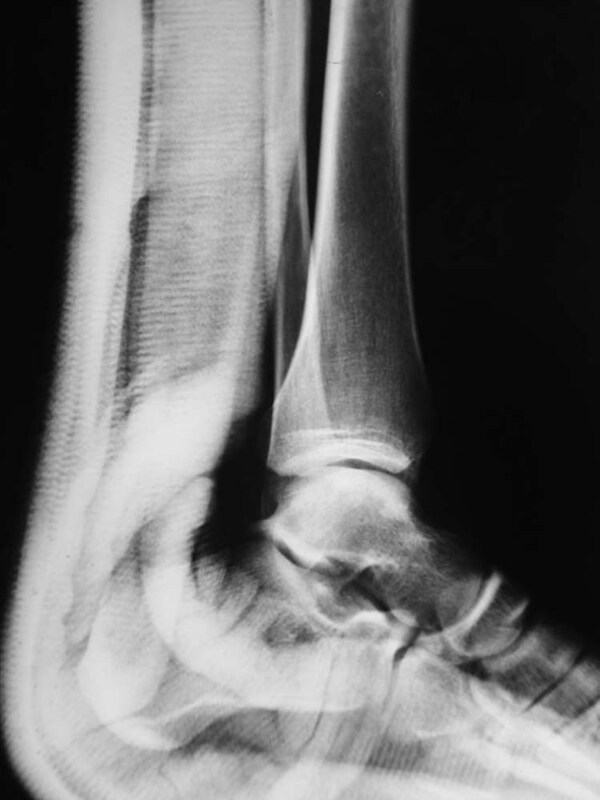 Radiographs of the ankle demonstrated ankle dislocation without concomitant syndesmotic injury or malleolar fracture. The ankle was reduced under general anaesthesia. After close reduction, a short leg cast was used for ankle immobilization. (Fig. 2) The patient was then further investigated with magnetic resonance imaging (MRI) to fully explore the structures that were injured. 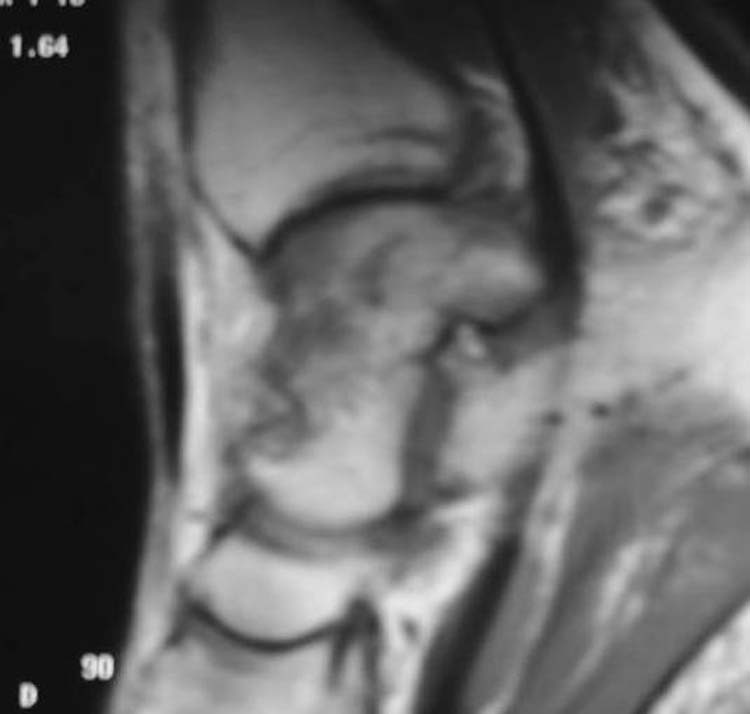 MRI demonstrated rupture of the anterior capsule and anterior talo-fibular ligament and talus bone contusion. (Fig. 3) The cast was kept on for two months. After the cast removal, the patient was referred to the physiotherapist and range of motion exercises were initiated along with partial weight-bearing. Three months post-injury, full weight-bearing was permitted. 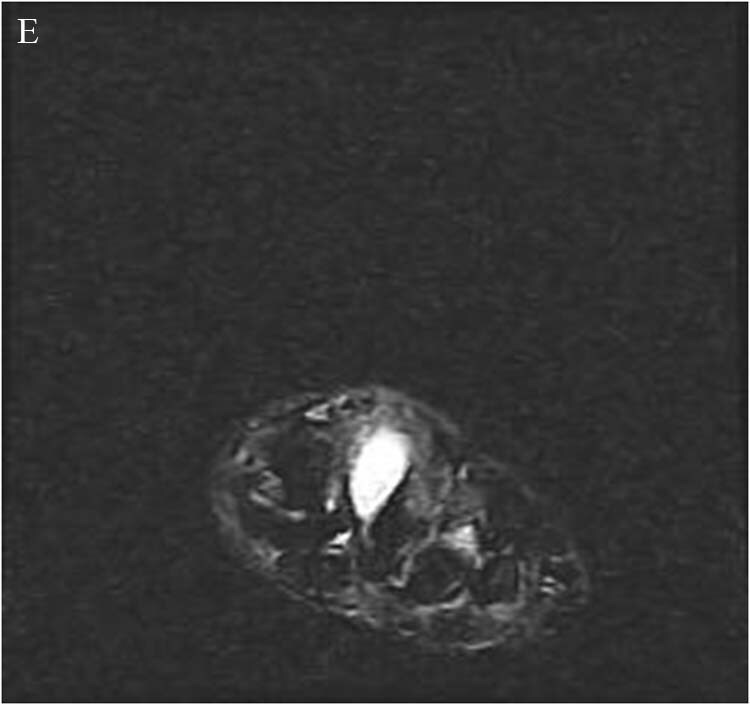 Figure 2 Lateral view of the tibiotalar joint after closed reduction. 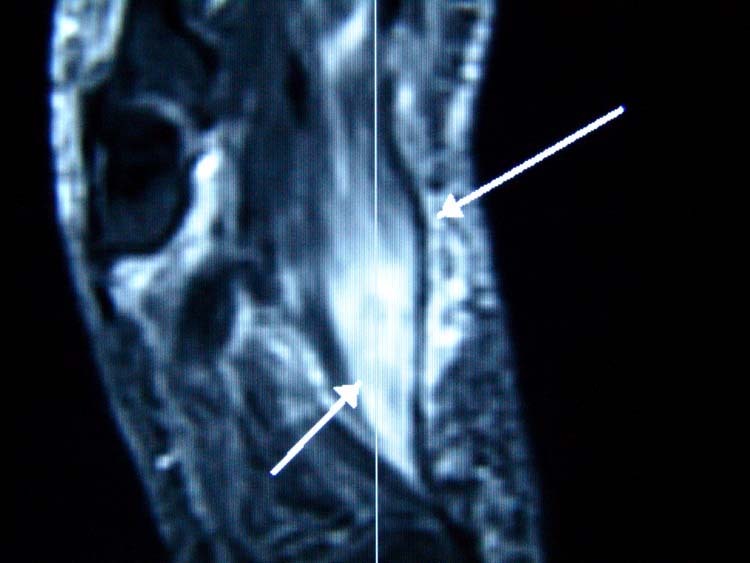 Figure 3 T1 sagittal image demonstrates talus bone contusion. The patient returned to the pre-injury level of activity at six months post-injury. At physical examination there were no signs of residual ligamentous laxity and no ankle effusion and tenderness. 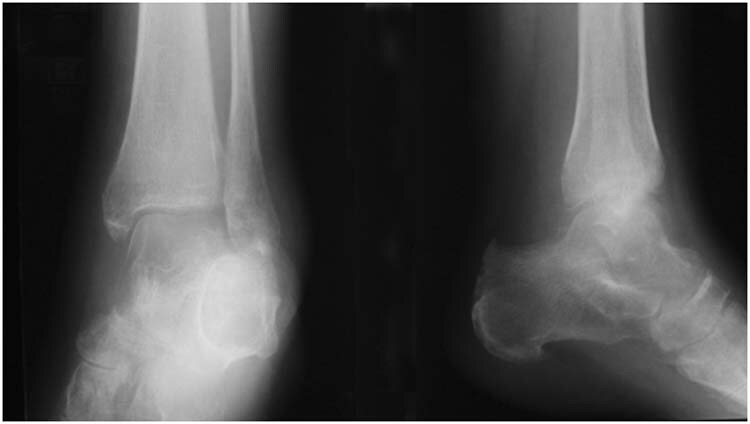 Three years post-injury the patient is still asymptomatic without signs of tibiotalar degenerative arthritis or talar avascular necrosis in ankle radiographs. Interestingly, none of these cases was investigated with MRI. All patients had conventional radiography that, generally, cannot reveal chondral or osteochondral injuries.6 In comparison, MRI is a high sensitive modality for detecting this kind of pathology. Sijbrandij, et al., found chondral and osteochondral injuries in 18% of their patients with ankle sprain. Ly and Fallat reported that these injuries are responsible for persisted pain and disability after ankle sprain. It is assumed that incidence and degree of bone contusion depends on the severity of the sprain and the residual instability that could cause recurrent sprains. The natural history of ankle bone contusion is still unknown. 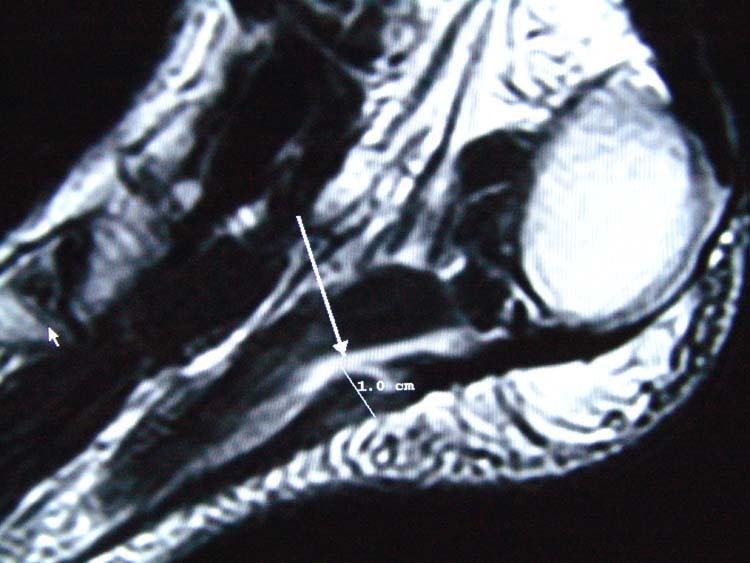 The evolution towards tibiotalar degenerative arthritis or talar avascular necrosis has not been extensively studied in the literature. Sijbrandij, et al., found that bone contusion was resolved in 1 – 4 months after injury, but in some cases persisted for more than 4 months. 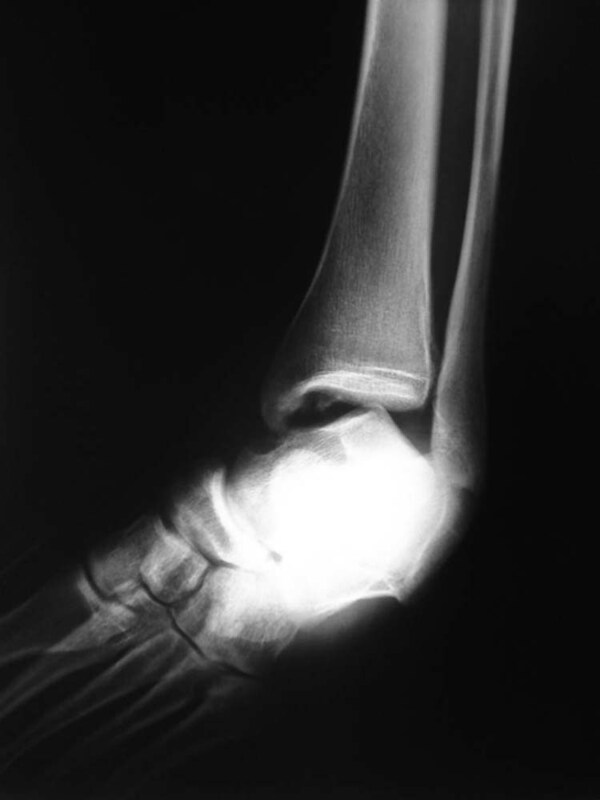 In contrast, degenerative arthritis after ankle dislocation should be anticipated in 25% of cases.5 As a result, MRI is mandatory for accurate diagnosis and proper treatment planning in these severe injuries. Most of the authors reported on ankle dislocation without fracture, recommend conservative treatment using a short leg cast for 4 – 6 weeks and full weight bearing at 3 – 6 weeks. Nevertheless, only Tayamaz and Gunal reported long-term results of their case. Consequently, no safe conclusions can be drawn regarding the success of the treatment. In our opinion, these cases should be treated individually, based primarily on an accurate diagnosis provided by MRI. The length of immobilization should be 6 – 8 weeks to allow soft tissue healing. Full weight-bearing should be decided according to the presence and degree of chondral and osteochondral injury in combination with joint effusion and tenderness assessed in physical examination. It is clear that long-term follow up studies are needed to establish treatment guidelines for these severe injuries. 1. Wilson MJ, Michele AA, Jacobson EW: Ankle dislocations without fracture. J Bone Joint Surg 21A: 198 – 204, 1939. 2. Uyar M, Tan A, Işler M, Cetinus E: Closed posteromedial dislocation of the tibiotalar joint without fracture in a basketball player. Br J Sports Med 38 (3):342 – 343, 2004. 3. Soyer AD, Nestor BJ, Friedman SJ: Closed posteromedial dislocation of the tibiotalar joint without fracture or diastasis: a case report. Foot Ankle Int 15 (11):622 – 624, 1994. 4. Taymaz A, Gunal I: Complete dislocation of the talus unaccompanied by fracture. 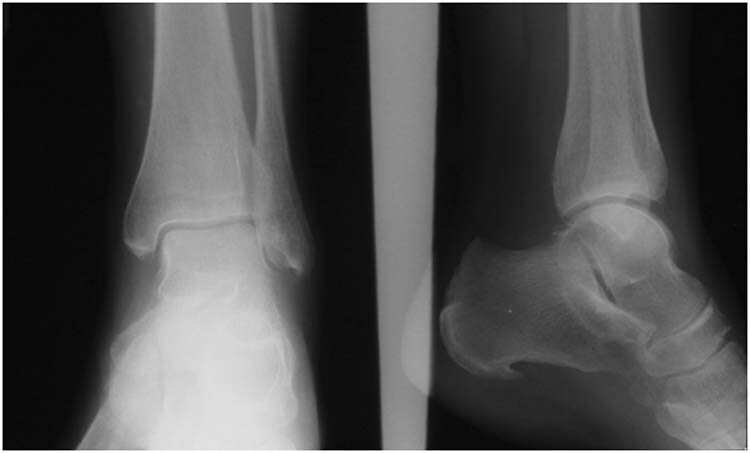 J Foot Ankle Surg 44 (2):156 – 158, 2005. 5. Elisé S, Maynou C, Mestdagh H, Forgeois P, Labourdette P: Simple tibiotalar luxation. A proposal of 16 cases. Acta Orthop Belg 64 (1):25 – 34, 1998. 6. Sijbrandij ES, van Gils AP, Louwerens JW, de Lange EE: Posttraumatic subchondral bone contusions and fractures of the talotibial joint: occurrence of “kissing” lesions. Am J Roentgenol 175 (6):1707 – 1710, 2000. 7. 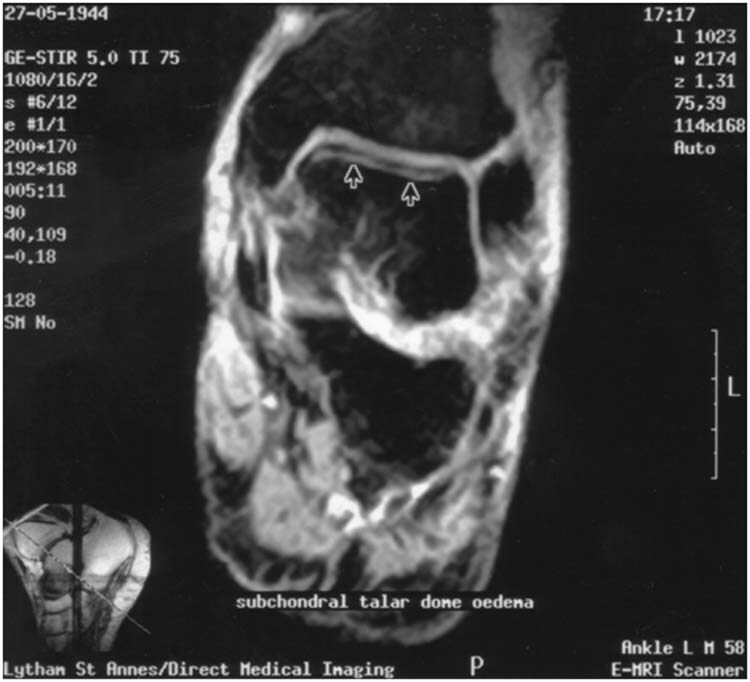 Ly PN, Fallat M: Transchondral contusions of the talus: a review of 64 surgical cases. 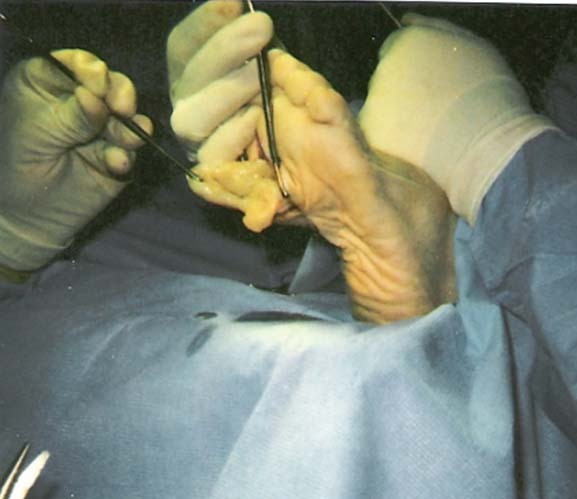 J Foot Surg 32 (4):352 – 374, 1993. Address correspondence to: N.E. Koukoulias, 161 Ethnikis Antistasis St, 55134, Thessaloniki, Greece, Tel: 00302310493552. 1,2,3,4,5 Department of Orthopaedics, Sports Injuries Unit, “Agios Pavlos” General Hospital, Thessaloniki, Greece.